Currently in early access, Factorio is a singleplayer and multiplayer factory building and management game from Wube Software which has sold well over a 100,000 copies despite still being in development. This makes the high demand for decent strategy construction and factory building games quite apparent. In games of this genre you can use your imagination to build anything you want, and in the case of Factorio you unleash your creativity by building and maintaining the factory of your dreams. Set the right inputs and get the product you are looking for. If factory management simulation games like Factorio are your cup of tea, we have a list of 5 alternative games which let you build hundreds of things, however you want or plan it. SpaceChem along with Infinifactory are the closest games to Factorio on the list. In this programming puzzle game, players take on the role of a reactor engineer working for SpaceChem, a leading chemical synthesizer for frontier colonies. Construct and manage factories to turn raw materials into valuable chemical products. The game starts in a simple manner but has a steep learning curve with the puzzles getting much harder after progressing further in the game. If you are looking for a rewarding mental challenge or just looking to hone up your programming skills, SpaceChem might be for you. Another highly recommended game from Zachtronics, the creators of SpaceChem, Infinifactory is a 3D sandbox puzzle game about building factories that assemble products for your alien overlords. The game features a story-driven campaign with over 50 puzzles many audio logs to collect in the process. Infinifactory allows players to design and run factories in a 3D first-person environment. The game boasts overwhelmingly positive reviews on Steam and can be purchased for $24.99. It is a challenging experience with your experiments failing multiple times before you get it right. People who love lateral thinking and logic puzzles should think about getting this. Prison Architect puts you in the shoes of an all powerful prison warden and lets you construct and maintain a state of the art correctional facility. But you will still get outsmarted by the your prisoners as they cause riots in your prison if you aren’t careful. You are in-charge of the management of all the prisoners, guards and staff at your detention facility. Build maximum safety holding cells, cafeterias, recreational spaces for the inmates, kitchens for your chef and other staff and manage your resources as you please. Be warned, once you start playing you will lose hours faster than you realize. RimWorld is an indie space colony construction and management simulation, released as an alpha in November 2013. It follows the story of three survivors involved in a spacecraft crash as they try to build a colony on an alien planet and flourish. You can manage the individual needs, moods, wounds and illnesses of the colonists. Gather resources and build your colony with the resources found on your frontier world. Defend against pirate raiders and other hostile tribes, while trying to survive rampaging animals and giant tunneling alien insects. Manage relationships of your colonists with their family members, lovers and spouses. Every play-through means a new randomly generated world with different kinds of terrain including deserts, jungles, tundras and more. And the AI Storyteller creates different story-based events during your adventure like finding resource drops and fighting raider pirates. Many, many hours of fun to be had with RimWorld. A sandbox village building and management game, Gnomoria puts you in-charge of a small group of gnomes who have set out on their own to settle a thriving new kingdom. Like Minecraft, everything can be scavenged and built elsewhere which gives the game a true sandbox feel. Gather resources, build your colony, attract nomads, defend against enemies and survive the harsh lands of Gnomoria. Even though the game has left early access and some of the planned features are still missing, there are quite a few hours of fun to be had. While it currently costs $14.99, we suggest waiting for the Steam summer sale which is just around the corner to snag it for a only few bucks. Much can be said about Cities: Skylines but it is best experienced first-hand. A modern take on a classic sandbox city building simulation like no other. If you loved the good ol’ days of SimCity, we can almost guarantee you will absolutely adore Cities: Skylines. Experience all the thrills and hardships of building and maintaining a modern metropolis. The variety of different buildings and services you can manage include police stations, schools, hospitals, fire stations, garbage disposal and lots more. Choose where you would like your city’s residential, industrial and commercial areas. You have almost full financial control of all your services and the taxation you receive from the different stakeholders of the city. The game offers a huge amount of content with hundreds of hours of gameplay in the form of replayability. Build small and big towns of different sizes in different kinds of terrains. If you are a fan of city building sims we highly recommend Cities: Skylines. In development since at least 14 years, Dwarf Fortess is a part roguelike, part construction and management simulation. Although not very pretty to look at, the game has proved to be an unbeaten addiction of many due to the open-ended nature of its randomly generated worlds. You embark on the expedition with 7 dwarves and can control pretty much all the aspects of their survival and fortress management including underground farming, creating trading caravans, homes for your dwarves, clothes-making, leather-working, butchery, et cetera. The micromanagement of workers is brilliant as you can assign different tasks to different dwarves. Will you be able to defend your fortress and settle a thriving dwarf kingdom? The game is fully free-to-play, so check out the official Dwarf Fortress website. Released in May of 2011, Terraria is an adventure-exploration sandbox RPG with a multiplayer component that still has thousands of active players with many new players joining in everyday. If you like to die a lot this game is perfect! You will die as much in the beginning as you will after you get much stronger armor and weapons. Terraria puts a high emphasis on exploration, adventuring, construction, crafting, combat and having fun. Construct the house or even the city of your dreams in 2D. The game also gets regular content updates from the developer showing the dedication to improve on an already great product. While not exactly like Factorio (different gameplay style); if you like adventuring into randomly generated 2D worlds, where you can do just about anything including construction and management of your resources, Terraria comes strongly recommended. Have played nearly all of these games and the closest to Factorio is Dwarf Fortress or RimWorld, the others are based in different settings. These games are in no way like Factorio. That may be true but sadly these are the closest games I have played or researched which in some way remind me of Factorio. Mostly due to the sandbox building and strategical nature of the games. If you have any suggestions please feel free to mention them and I will add them to the list. Infinifactory or even Spacechem are by far closer to Factorio than any of those games. but they didn’t even mention them. Well, fair enough. You are definitely correct that these games don’t bear too much resemblance to Factorio. But being it a little reasonable and fair, the genre is pretty rare and similar games are hard to find. 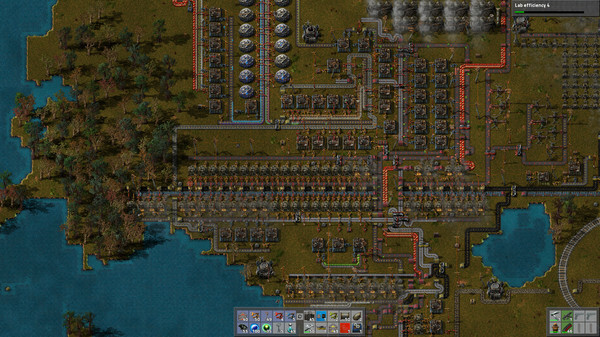 Factorio is probably a first for many people in this kind of genre. Thanks for your suggestions and input, the games you mentioned (Infinifactory and Spacehem) will be added to the list. If you have any more suggestions please feel free. Thanks again for another relevant suggestion. And since it is so much like Factorio, Factory Idle will be added to the list. Add BigPharma to the list. That game is closest to Factorio. Thank you for the suggestion. Will research into BigPharma and add it to the list. Thanks, I was trying to find the name of that game in google and got to this post.